Update: 00Z GFS came in with a more northerly track. This would translate to a lower snow total across the area but an increased danger of icing. The 00Z ECMWF came in northerly too, more so than the GFS did. This track would lead to some icing at the beginning for all areas before switching over to all rain. The 00Z NAM is the southern extreme which would lead to mostly snow across the area with a mix near the coast. I will review the data in the morning and type up a summary. As of February 14, 2015, most of ENC has yet to see accumulating snow for this winter season. Some areas did see snow flakes flying a couple of weeks ago but nothing of any real substance. This could change next week with the approach of the next system setting it’s sights on the southeastern CONUS. Keep in mind that the following discussion does not constitute an actual forecast but a summery of current thinking based on current evidence and interpretation. An upper-level low that has been sitting near Baha California, Mexico will be picked up by the upper jet shifting it eastward by Sunday night. A weak shortwave will travel eastward Monday bringing with it a slight chance of precipitation. I say slight because the lower levels will be dry as a result of the cold airmass left by the passing front on Saturday. Given how dry the atmosphere will be at that time I don’t feel we will see precipitation early on Monday. If the atmosphere is able to overcome the lack of moisture, thermal profiles indicate an all snow precipitation type. If this starts early enough and heavy enough some accumulation could be possible for southern sections of ENC. The real action develops as an upper-level trough becomes more amplified and swings through the deep south. A surface low will develop over the Gulf Coast early Tuesday morning. Ahead of the low, southwesterly flow will usher in moisture from the Gulf of Mexico and setting up an overrunning situation starting as far south as southern South Carolina. The onset of precipitation will be determined by how dry the low-levels will be. If sufficient moisture does exist at the low levels or enough evaporational cooling were to occur quick enough, the precipitation will start as all snow for all sections. Placement of the surface low will be the key to the forecast going forward. A couple of options are a more southerly track which would take the surface low along the Gulf Coast and up the east coast just offshore (12Z GFS on 2-14-15). In this scenario, ENC would see an onset of all snow before a transition to sleet/ice as the low begins to approach the region as mid-levels warm. The depth of the warm layer will be shallower leading to a later change-over for inland sections and a quick change-over for coastal locations. The rain/snow line will start over southern ENC and work it’s way northwestward through the day on Tuesday. The rain/snow line would reach near the I-95 corridor. As the low departs northeastward off the coast rain would change back over to snow before ending. Surface temperatures will remain in the 30s through the day Tuesday with some coastal sections reaching the low 40s. This is an eastward shift for the GFS over the past couple of days so I approach this solution with some skepticism. 12Z GFS forecast precipitation type for Tuesday-Wednesday. Click to enlarge. Scenario 2 (12Z NAM on 2-14-15): The surface low develops over the Gulf Coast Tuesday morning and begins to shift eastward then northeastward over central Georgia/South Carolina. This takes the surface low directly over ENC. In this senario, most areas will start off as all snow and the transition to ice would occur sooner as a deeper warm layer would reach further inland. The rain/snow line would then reach as far as a line from Richmond, VA through Greensboro, NC. Snow fall totals would drop significantly across the area with a longer duration of rain. The precipitation could end as snow as the surface low departs to the northeast. 12Z NAM forecast precipitation type animation. Click to enlarge. Scenario 3 (small chance at this time): The surface low develops over the Gulf Coast and tracks further inland. The onset of precipitation could start as frozen but quickly changes to rain and remains as rain throughout the duration of the event. The 12Z ECMWF does nothing to help clarify the forecast at this point. The 12Z NAM (slow and north), 12Z GFS (a little quicker and south), and 12Z ECMWF (very fast and south) have very different solutions which will lead to big swings in the forecast. 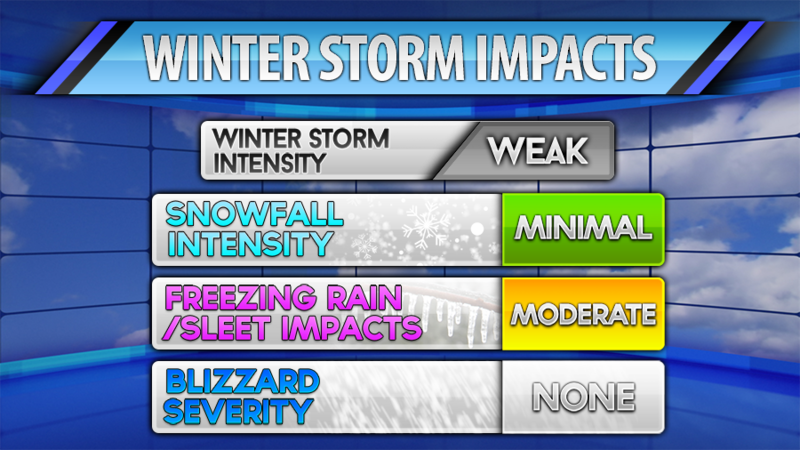 Potential winter storm impacts on Tuesday-Wednesday. I’m not going to provide a snow total forecast map at this time and will wait until certainty is greater. This storm could change since the shortwaves in question haven’t even been sampled for model input. Once that occurs we will have a better handle on future events and hopefully increase confidence.